Latrice Royale's one woman show Here's To Life, which is currently enjoying a return engagement at The Laurie Beechman Theatre in NYC is definitely one of the best "one person" shows I have ever seen! What makes Latrice's show so different from other drag shows is that Here's To Life is Latrice's true life story, not based upon a persona. She tells her true life story, taking the audience from birth to today. Latrice does not hold back in this show. She talks about everything from her triumphs to her hardships to her revelations of what she has learned along the way. I have seen a lot of drag shows in my time and while other performers take a dark humor route, Latrice speaks the truth. She's telling a very real story, one with a lot of hurt, but also filled with love, life, and second chances. Born in Compton, CA, Latrice was the youngest of five boys. Like she says in the show,"By the time I was born, they've must have run out of testosterone because I came out and was like Hi world!" Growing up gay in Compton was no easy task. But those trying times lead Latrice on her path to where she is today, traveling around the world entertaining and educating people about celebrating who you are! Latrice RoyaleWhile there is so much in this show I want to talk about, I dont' want to give anything away (aside from the joke I already mentioned) because this is one show you have to see! Latrice's performance and show reminded me to always be proud of who I am and what I have accomplished at each given moment. Most of all, Latrice's show inspired me to keep working towards the change I have been striving for. She says, "You're in control of your destiny and only you can decide how you want to rewrite the script." Those words rang deep with in me and I'm going to keep them by my side as a reminder to keep going, even when I'm not sure where it's all going, and when things start going in a direction I don't want them to be going, I'm going to rewrite, rewrite, rewrite! 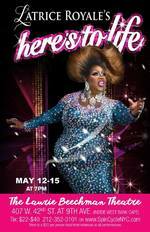 Latrice RoyaleI hope everyone reading this piece will rewrite their destiny and go see Latrice Royale's Here's To Life at The Laurie Beechman Theatre in NYC (407 West 42nd Street, between 9th & 10th Avenue, inside the West Bank Cafe). Here's To Life plays through Sunday, May 15! Click here for tickets!